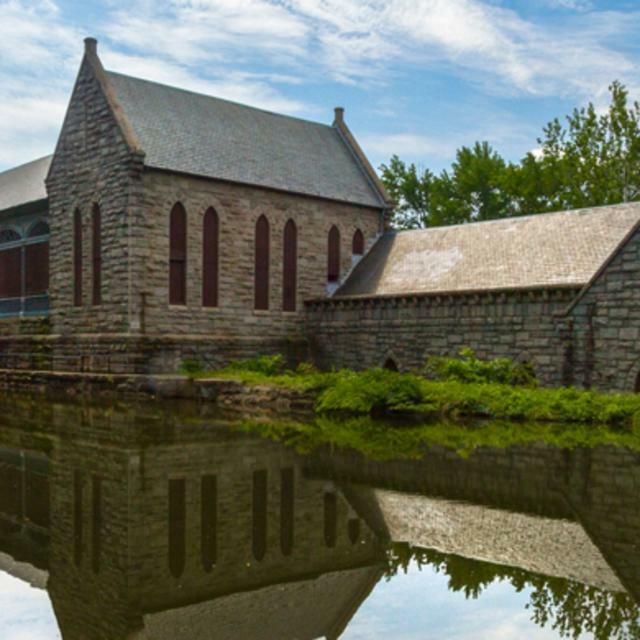 The Victorian Gothic treasure that is the Pump House is located in the Byrd Park District, west of the Boulevard Bridge on the Kanawha Canal. It was designed and constructed in the 1880s under the leadership of the great Richmond city engineer Col. Wilfred Emory Cutshaw. A description of its original functions from the National Park Service: A municipal industrial building whose purpose was to house the Richmond city waterworks. The building, which served as the city’s waterworks from 1883 until 1924, is conveniently situated to draw water from the James River and Kanawha Canal as well as its own smaller canal. The facility pumped water uphill from the canals to the Byrd Park Reservoir, the city’s main water supply. Far from being entirely simply utilitarian, however, the pump house was also a popular gathering place in the late 19th and early 20th centuries. A dramatic feature of the Pump House is the old open-air dance floor — an open space with a balcony above the pump room on the top floor of the building. The future plan for the Pump House is that it will one day make a grand return as the new home for the park system visitor’s center or a James River museum. It may also be a learning center, host weddings, parties, meetings, events and the batteau rides on the Kanawha Canal could again be a feature.